Jarrod Green is an early childhood educator with over a decade of experience in early childhood education. His teaching practice centers around an emergent, project-based approach to curriculum, with an emphasis on learning through play, developing relationships and communities, and building self-regulation and resilience. Green also presents at many professional conferences, including NAEYC’s Professional Development Institute. Children must learn to pick themselves up, brush themselves off, and bounce back. 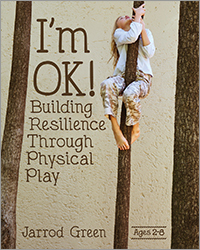 But how do you allow for the physicality required to build resilience when you are tasked with children’s safety? This guide provides the tools and strategies for creating a culture of resilience, including families in the process, and keeping safety front-of-mind.